Gaps found between window and door frames open up the opportunity for unwanted air flow. Spraying a bead of foam sealant with straw applicator or gun barrel into these openings can help create an air tight seal to stop the flow of unwanted air and noise. 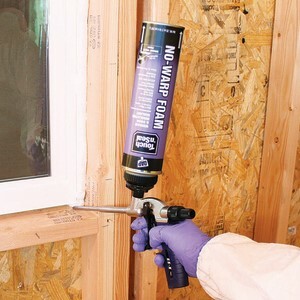 Touch 'n Foam Professional Window & Door and Touch 'n Foam No Warp are 1-component minimally expanding polyurethane foam sealants that are guaranteed to not warp or bow window or door frames and jambs.